State Department spokesman Robert Palladino faced a grilling during the department’s press briefing on Wednesday when he couldn’t answer whether the US has nominated ambassadors to Saudi Arabia and Turkey. The leadership vacancies in Riyadh and Ankara are of particular concern following he recent disappearance and alleged murder of prominent Saudi critic Jamal Khashoggi in the Saudi consulate in Istanbul. State Department deputy spokesman Robert Palladino faced a grilling during a press briefing on Wednesday when he couldn’t answer whether the US has nominated ambassadors to both Saudi Arabia and Turkey – a question of serious concern following the recent disappearance of prominent Saudi critic Jamal Khashoggi in the Saudi consulate in Istanbul. Matt Lee, a diplomatic reporter for The Associated Press, first asked Palladino whether he could name the American ambassadors in Riyadh and Ankara. When Palladino said he “didn’t have that in front of me right now,” Lee pressed him. “The answer is that you don’t have an ambassador in either place, right?” Lee asked. Palladino sidestepped the question, instead insisting that the department has senior career diplomats in both countries. So Lee asked him to name the people who have been nominated to fill the empty ambassadorships. Palladino responded that he didn’t know. “Matt, I don’t have that in front of me right now. And – but let me just say these are senior Foreign Service officers that have had full careers, and we’re confident in our team’s ability,” he said. When Lee tried to ask another question, Palladino cut him off, turning to Fox News for the last question of the briefing. “Let’s go to Fox,” he said. 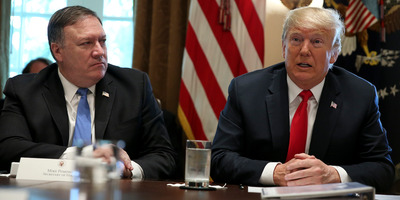 The exchange came as the United States faces increasing pressure to respond to Khashoggi’s disappearance and alleged killing at the hands of his own government. Journalists and critics say the US government’s response to the incident has been slow and underwhelming, in part because of Trump’s reluctance to weaken the country’s lucrative relationship with the Saudi government. “Khashoggi’s disappearance reflects a strategic calculation: They think they can abduct or murder a journalist working for an American news organisation without facing serious consequences. So far, they’re right,” Washington Post columnist Brian Klaas wrote on Wednesday of the Middle Eastern regime. Khashoggi, who wrote op-eds critical of the Saudi regime for The Washington Post, vanished earlier this month after entering the Saudi consulate in Istanbul to obtain documents to marry his Turkish fiancée, Hatice Cengiz, who waited outside the building. Cengiz and Turkish security officials say Khashoggi never left the consulate. Turkish officials have accused Saudi officials of flying in a 15-person hit team to kill and dismember Khashoggi before flying his body out of the country within hours of his arrival at the consulate. Saudi officials have denied that he was killed and say he left the consulate, though no footage or witnesses ever saw him exit. Some security footage has mysteriously disappeared, according to Turkish authorities.